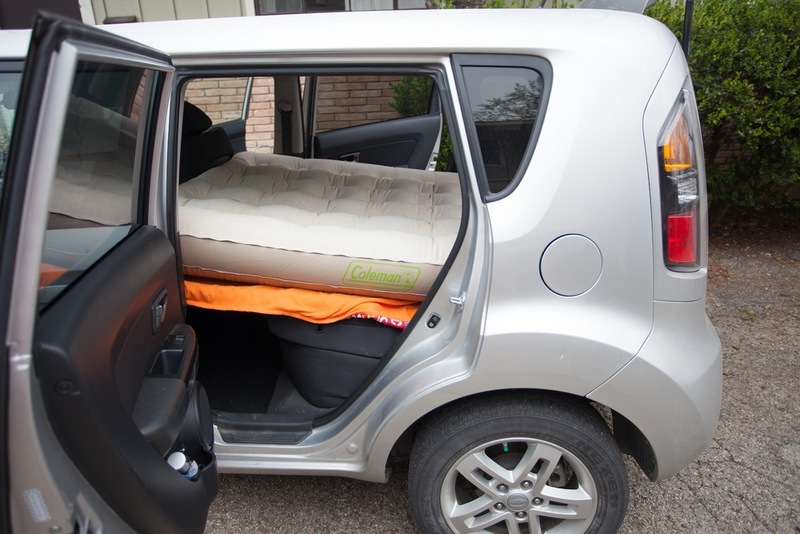 Can you sleep or camp in a Kia Soul? Yes you can! When Amanda and I were getting ready to take a trip to West Texas, we knew we didn't want to spend money on a motel. We planned to be gone for at least a week, and paying to sleep would have cost us, well, pretty much all the money we had. Camping was considered, but a tent, sleeping bags, camp sites…these things also cost money. Besides, I actually enjoy sleeping in a car more than a tent. For one thing, it keeps you off the ground, and thus away from creatures and moisture. Another thing, it protects you from wind, rain, and other elements. Finally, its just easier to pull into a parking lot, or off the road and have everything ready to go for spending the night without drawing attention to yourself. 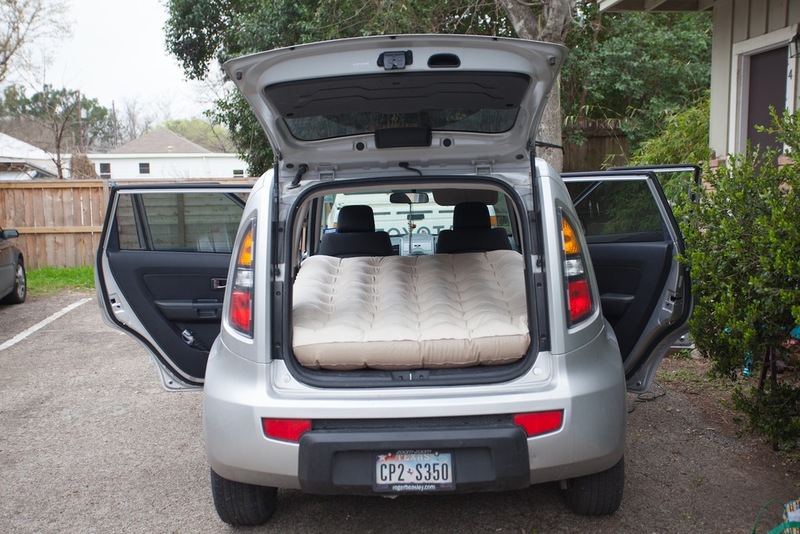 The hinges allow you to fold the board in half and fit it into the car. It is also makes everything easier to deal with while driving. Some foam pipe Insulation - I forget what size. All told, it cost about $90 for everything, including bed and pump. I wrapped pipe isolation around the edges of the board and secured it with duct tape to keep the wood from scratching the interior. Make sure the driver and passenger seats are upright and pushed completely forward. This gives you about 5' 11" of room with the rear door shut. The sleeping board rests perfectly on the middle arm rest. No need for additional support. I then cover the sleeping board with a blanket to keep wayward splinters away from the air mattress. A piece a cardboard would also work. And there you have it! Your ready to go. Feel free to ask any questions in the comment section. Happy Trails!